Security guards can expect a big pay bump if a plan by the National Trades Union Congress (NTUC) to raise their basic monthly wages by $300 receives the green light from employers. The Straits Times understands that NTUC representatives met security firms two weeks ago and tabled a new wage ladder. The proposal includes raising the minimum basic monthly pay for guards to $1,100 per month - a substantial increase from the current $817 stated in the last Manpower Ministry salary data report released in June. If the new minimum wage is pushed through, security guards can earn about $2,100 each month with overtime, up from just $1,678 now, say industry players. Security guards typically work 12 hours each day, six days a week. The bulk of their pay comes from overtime work. There are about 70,000 licensed security guards in Singapore. But the low basic pay and long hours have kept about 30,000 of them away from work, adding to the manpower crunch in the sector. The NTUC confirmed that a committee of unionists, employers and government officials have indeed met security agencies but declined to elaborate further. NTUC assistant secretary-general Zainal Sapari, who is also a member of the NTUC-led security tripartite cluster, said while the wage ladder is under discussion, "no decision has been made". The latest push comes nearly a year after a similar move by NTUC to raise the pay of security guards in September last year was rebuffed by the Security Association of Singapore, mainly due to concerns of rising wage costs. Industry insiders, however, believe that unlike last year, this renewed push has the backing of the Government. In January, Deputy Prime Minister Tharman Shanmugaratnam announced the Government will implement a "progressive wage model" in the security industry, after a wage ladder kicks in for the cleaning sector next month, which sets the basic monthly pay of cleaners at $1,000. Apart from those in the cleaning sector and security industry, the Government has also targeted workers in the landscape sector for pay hikes as part of a broad push to raise the income of low-wage workers. 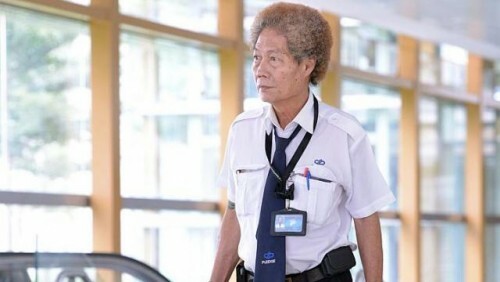 Under the wage ladder drawn up by the NTUC, security guards can be trained to become senior security supervisors in six years, earning a basic pay of $1,700 a month, up from $1,100. The latest move drew support from industry players like Mr Robert Wiener, president of the Association of Certified Security Agencies. He said the latest NTUC proposal is something the association can "reasonably support". "But the industry will need time to adjust, over a couple of years." Security Association of Singapore president T. Mogan, however, said firms are still facing cost pressures. "At the end of the day, we are running businesses and we are worried about costs like Central Provident Fund rates and foreign worker levies, both of which are also going up," he said. At least one security guard The Straits Times spoke to, however, felt the pay rise was long overdue. "At $1,100 a month, it is only a bit higher than the $1,000 basic pay that cleaners are already getting," said 59-year old Edmund Chua, a guard of more than 10 years. "This shows how little we value the work of security officers."